The life-saving medical technology known as Magnetic Resonance Imaging, or MRI, makes detailed images of soft tissue in the body, nearly eliminating the need for exploratory surgery. Unlike X-rays, it can distinguish gray matter from white matter in the brain, cancerous from noncancerous tissue, and muscles from organs, as well as reveal blood flow and signs of stroke. Particle physics plays a key role in producing breathtaking images of the human body. The basic principles behind MRI emerged from early research in particle physics. Fifty years later, the field again played a critical role in making MRI machines commercially available. In 1937, Isidor Isaac Rabi observed that hydrogen atoms respond to a strong magnetic field by pointing in the same direction, like compass needles. Scientists later discovered that the field was actually acting on the nuclei of the atoms, which are positively charged. When a second magnetic field, oscillating at just the right frequency, hits the atoms, some of the hydrogen nuclei get an energy boost and do a 90-degree flip. When the second magnetic field is removed, the nuclei return to their original positions. This realignment takes place at different rates in different materials, giving scientists a way to distinguish between them. In 1946, Edward Purcell and Felix Bloch determined that the strength of the magnetic field and the frequency of the second magnet are linked by a phenomenon they called nuclear magnetic resonance, or NMR. Soon, NMR was being used to analyze the chemical natures of liquids and solids. Since the human body is 55-60 percent water, and each water molecule contains two hydrogen atoms, the technique would be ideal for studying living tissue. In 1973, Paul Lauterbur found that by applying a gradient to the large magnetic field, he could identify the locations of individual hydrogen atoms in a sample. He used this additional information to make the first NMR image. 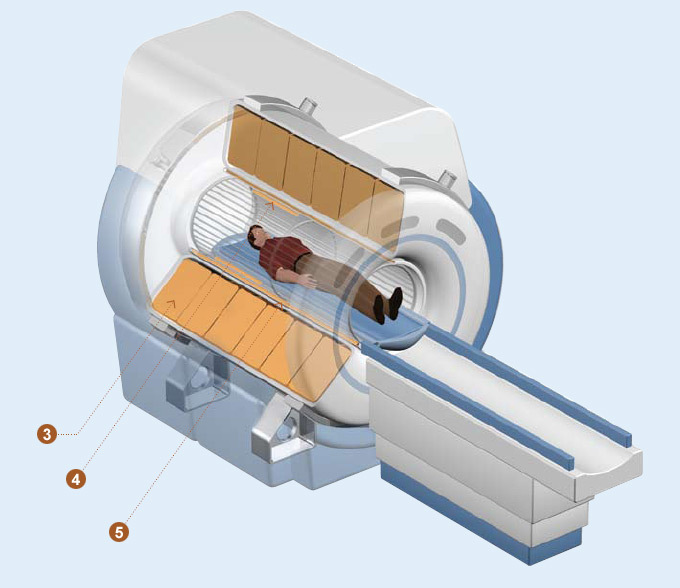 The word nuclear was later dropped so as not to imply a threat of radiation, and the technique became known as MRI. Rabi, Purcell, Block, and Lauterbur all earned Nobel Prizes in physics for their work. In 1974, just as Lauterburs technique came onto the scene, Fermi National Accelerator Laboratory began building what would become the worlds largest particle accelerator, the Tevatron. Serendipitously, both the Tevatron and MRI technology were at major turning points, both pivoting on the need for very strong magnetic fields. Aligning hydrogen atoms in the human body during an MRI scan requires a magnet 3000 times stronger than the permanent magnets on your refrigerator. But large permanent magnets are impractical because they cant be turned off, are extremely heavy, and generate magnetic fields that can become unstable. Meanwhile, the Tevatron needed magnets 4000 times stronger than refrigerator magnets to propel particles along its four-mile-long particle racetrack. Previous accelerators used magnets made of electrical wire wrapped into cylindrical coils, but those electromagnets lose significant amounts of energy as heat, ultimately driving the electricity bill through the roof. The solution, for both particle-smashers and advanced medical imaging, was superconductivity. When cooled to temperatures near absolute zero, wires made from certain metal alloys, such as niobium-titanium, allow electric current to flow freely without losing heat. Wound into a coil, they become superconducting magnets, an energy-efficient technology that was already familiar to physicists. But at the time, no one in the world made superconducting coil at the scale Fermilab needed for the Tevatron, or even on the smaller scale that could benefit MRI. Companies in Canada, China, and Brazil normally sold these metal alloys only by the kilogram; Fermilab started buying them by the ton. The lab provided the raw metals to manufacturers, along with specifications for how best to achieve long lengths of perfect wire. To work correctly, superconducting wire must be heated, molded, and shaped using special techniques. Rather than patent these procedures, Fermilab made them freely available, opening the door for both domestic and foreign companies to manufacture superconducting cable on a larger, more affordable scale. This paved the way for the commercial development of superconducting magnets for MRI machines. While modern MRI machines still cost anywhere between $1 million and $3 million, more than 25,000 of them are in use in hospitals and medical facilities, and that number continues to grow.